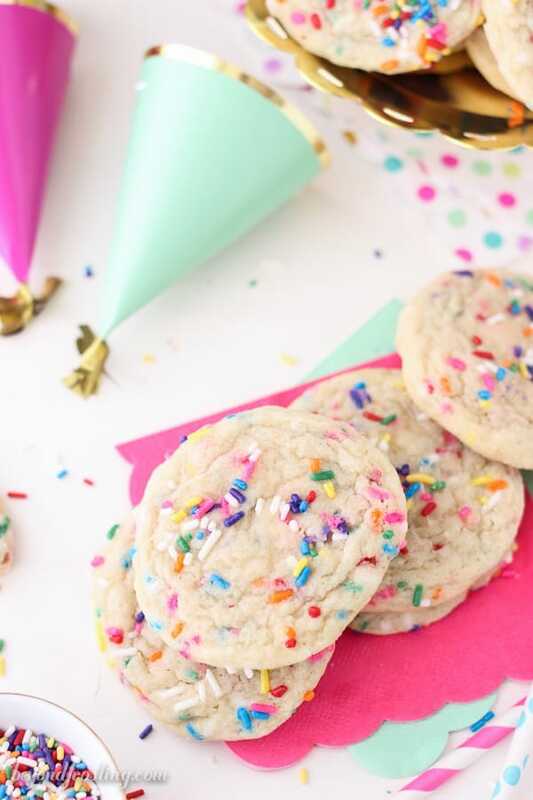 These soft and chewy Sprinkle Sugar Cookies are simple to make and always a hit. You know you have the perfect sugar cookie when you don’t want to share. 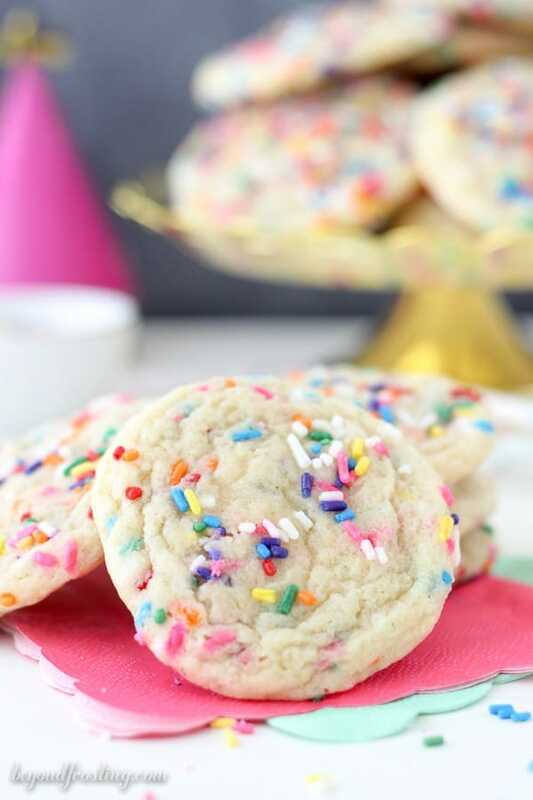 This post for Sprinkle Sugar Cookies originally appeared on Chocolate Chocolate and More. I want to hear all about your fun plans for the weekend. Memorial Day kicks off the start of summer time, and well, it’s my birthday weekend. Normally for a long weekend I would be preparing ALL the desserts to line up for photo shoots and tons and of blog stuff, but I’ve decided this weekend I’m going to take a break and only do minimal work. I know we’ve got some fun things planned, but I really just want to sleep in and watch movies. I know ya’ll are baking stuff to take to the BBQs, right? If you’re scrambling for some last minute ideas, poke cakes make great desserts for potlucks (but these do require a refrigerator), but a great alternative is to bring cookies or some type of bar. Good thing I’ve got you covered on that. 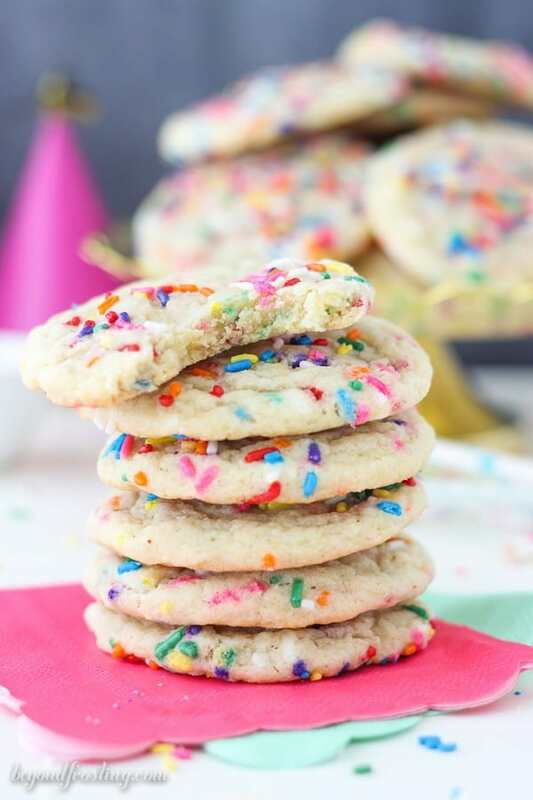 I’d like to introduce you to you to Sprinkle Sugar Cookies. 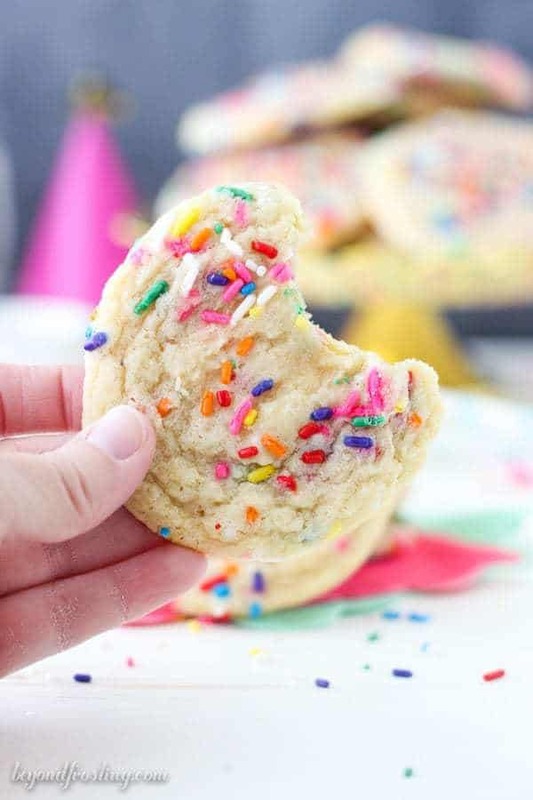 You know when you see a beautiful plate of sprinkle sugar cookies on the table, but then you bite into them and they are crisp and a shortbread-like texture? I can’t even handle that. I usually won’t both wasting the calories. So I wanted to make sure that when I shared a sprinkle cookie with you that it lived up to my standards. These cookies are soft, chewy and buttery, crisp on the outside and slightly gooey in the middle. I definitely under bake these just a touch so that they turn out exactly the way I want them. Just follow the suggested baking times in the recipe, and if you like a more crisp cookie, consider adding 2 to 3 minutes onto the baking time. The one catch about this recipe is that it does require some time in the refrigerator. This is a necessary step and cannot be skipped. I like to scoop all the dough onto a cookie sheet and then take them out and place them on a baking sheet. That way I can just grab the scoops of dough when I am ready to change out the batch. Normally, when I put a batch in the oven, I will take out the next batch and let them sit on the counter while the first batch is baking. This allows the dough to soften slightly and then the cookie will bake a little more evenly. 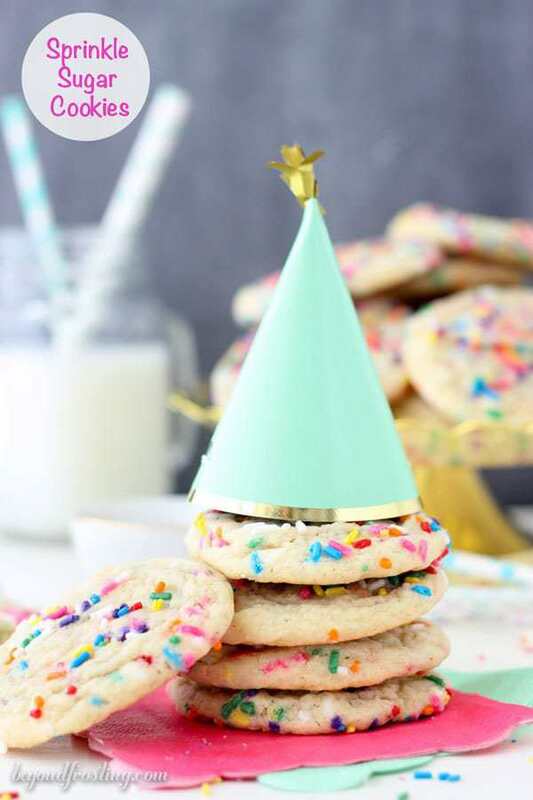 There is one other requirement for these cookies, they must be LOADED with sprinkles. So I’ve added sprinkles into the cookie dough itself and then rolled them in more sprinkles just before popping them in the oven. It does help if the dough is a little bit softer when you roll them in the sprinkles, but don’t be afraid to use your hands to pat the sprinkles into the dough. 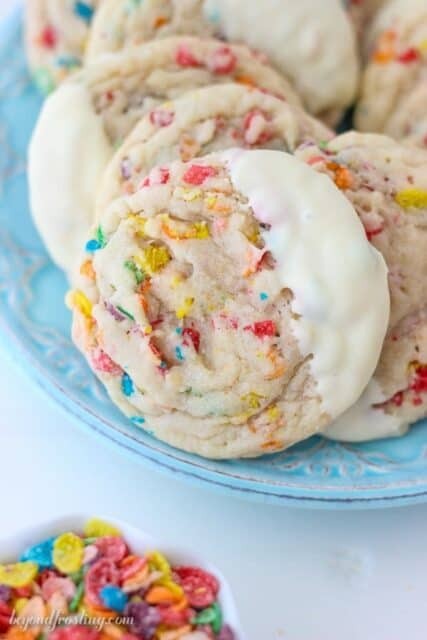 I’ve made so many different recipes using this basic dough, so if you’re looking for something different, you might want to try: Frosted Strawberry Pop Tart Cookies, The Best MnM Cookies or these White Chocolate Cranberry Orange Cookies. Add eggs and vanilla extract. Mix into butter and sugar until egg is well beaten. In a separate bowl, combine flour, baking soda and cream of tartar. Slowly add the dry ingredients into batter and beat on medium low speed until well combined and dough forms. Add ½ cup of sprinkles to the dough and mix until the sprinkles incorporate. Refrigerate dough for a minimum of 30 minutes and up to 1 hour. 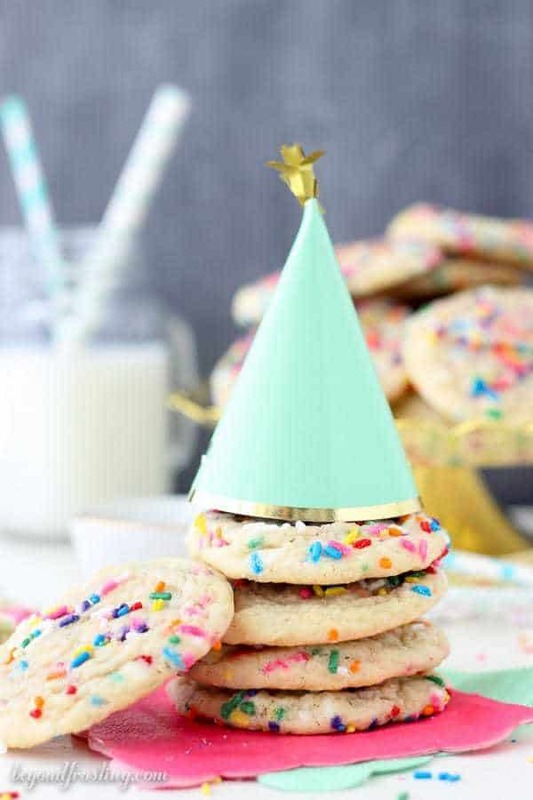 Use a large cookie scoop (3 tbsp) and scoop cookie dough into a bowl of sprinkle. Roll the top of the dough in the remaining sprinkles and then place on a baking sheet lined with parchment paper. 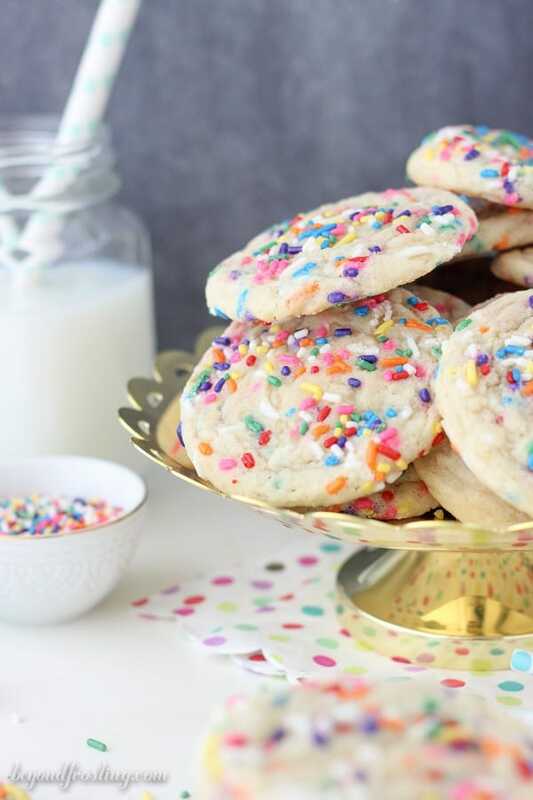 Sprinkle cookies are just the best, you can’t help but be happy picking one or five of those up! 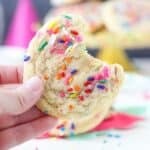 LOL I made 4 dozen sprinkle cookies in the last week and I still love looking at yours!! These are AMAZING! I love your gorgeous party photo shoot! Pinned!